You arm yourself so you're hard to kill. Know the law so you're hard to convict. Let's face it, the world isn't always nice. That's why you take steps to protect yourself and your family. Whether it be that shotgun in the corner, the sidearm on your hip, or the pepper spray you gave your daughter, you meet that fundamental responsibility. But if you're like most people, your preparations still lack a critical element. You still need to know how to survive the critical fight that looms after any defensive encounter: the legal battle. 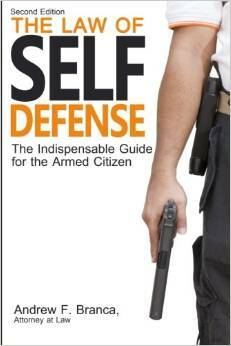 The Law of Self Defense provides precisely that critical, missing knowledge. This book includes not just the laws of all fifty states, but how the courts apply those laws. It's a plain-talk analysis that makes the law easy to understand for anyone, not just lawyers. Bestselling author, Andrew F. Branca, is not only a lawyer and internationally recognized legal consultant, but also a life-long member of the gun community--more than 20 years as an NRA Life Member and Instructor, an IDPA Master-class competitor, and a 2nd Amendment absolutist. Learn how to make fast, effective decisions and confidently handle life-and-death situations both tactically and legally. A limited quantity of this book will be available at member meetings for a discounted price.